It’s January, and if you’re anything like us we thought you could do with a little inspiration to kick-start those home decorating jobs that are just waiting to be tackled. So, this month we’ve caught up with award-winning interiors blogger, vlogger and presenter, Jen Stanbrook of Love Chic Living to talk trends, design inspiration and how she injects personality and practicality into her home. Creating on-trend spaces that work for busy family living, Jen recently unveiled her new dining room and kitchen makeover featuring our Neisha Crosland ‘Check’ vinyl floor tiles! Tell us about the concept behind Love Chic Living – how did you get into blogging? So I’d been blogging for a little while in a completely different niche and feeling very frustrated with it when I had a little brainstorming session with a lovely friend who’d been blogging for some time. I had always had a passion for interiors, and one day dreamed of opening an interiors store. With that a little way off, it seemed a natural step to start blogging about home interiors, but nothing high end, just beautifully stylish pieces, great design and cool home accessories for a family space. What does a typical (or not so typical) week look like for you? Oh wow, great question! I suppose there’s no typical week as there are always very different jobs to be done, but essentially, I do spend a lot of time at my laptop in my little office room. I work around my children so as soon as they’ve gone to school I get started, and I usually take a break when they come in. They’re older now so I do get another hour or so afterwards to continue working before making myself pack the laptop away. My time is divided between writing blog posts, styling and taking images, working through email and using social media to keep up to date with everyone. Your home is beautiful and obviously reflects your love for design. What three interior must-haves can’t you live without? Hmmm, that’s a tricky one. I think definitely candles, particularly scented ones, then plants, although this is quite a new addition for me, and then finally a decent throw. I’m a very tactile person and love texture and warmth in my home accessories. We’ve been following your fab home makeover and love how you’ve used our Neisha Crosland ‘Check’ vinyl floor tiles in the dining room and kitchen. What was the inspiration behind the bold look? From the moment I started on the makeovers I knew I wanted a bold statement. I played with the idea of wallpapering the ceilings but when I spotted the Check floor tiles online, I knew they were perfect for what I wanted to achieve. 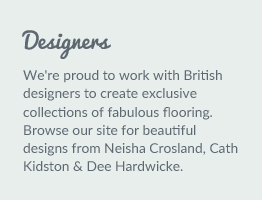 Why did you opt for vinyl floor tiles in the makeover? A few years ago, during a mini hall makeover I decided on some Harvey Maria wood-effect vinyl tiles for the floor after hearing how beautiful there were from a friend. Knowing how durable, easy to keep clean, and great they looked, I knew that vinyl tiles would be ideal in the kitchen/dining spaces. What advice do you have for any budding home renovators who want to create a dramatic change in their interior on a budget and with minimal disturbance? One of the biggest things you can do to ensure you get the look you want on the budget you have, is to do as much as possible yourself. I find once you start involving tradespeople, it’s very easy to be swayed by their opinions (not always stylish or trend-led ones at that!) and of course, labour can be very costly. The more DIY you can tackle, the better you’ll feel about the end result too, and you’ll have much better control over the mess! 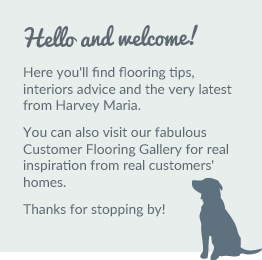 At Harvey Maria, we believe that practical flooring doesn’t have to compromise on style. How do you create a home that caters to both family living and your love of interior design? This has been hard to be honest, but the first thing to keep in mind is that your home doesn’t have to be boring just because you have children. Yes, certain elements will always need to be practical (think washable covers and wipeable surfaces) but kids love bright colours, they actually appreciate great design, and they’re happy to give you their opinion. So, involve them in the decisions, or at least give them guided choices and they are a great help at creating a space that works for every member of the family. Where’s your favourite spot in the home? Oh, this is my newly made over kitchen and dining space. Even though the Harvey Maria floor flows from once room to the other, they have quite a different vibe. The dining room space is a great hang out, relaxing and calming and practical too, whilst the kitchen has a much fiercer look, with a monochrome base and bright pops of yellow. What are your favourite go-to homeware and lifestyles stores? At the moment I’m loving Maisons du Monde for their varying ranges and contemporary pieces, plus H&M Home have a great selection of accessories for every room in the home. What home trends do you see coming through for 2018? 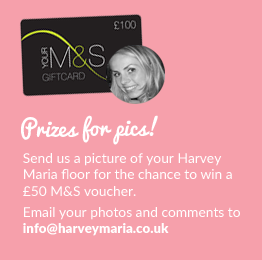 And which will you be snapping up? Well, even though there’s been a mixed reaction to Pantone’s Colour of the Year, Ultra Violet we will probably be seeing a purple entering the popular jewelled colour palette. Feathers and rainbows seem to be finding their way from fashion into interiors too, and as colour blocking has been popular in fashion for a while, we’ll see it more and more in our home interiors too. Jen Stanbrook is a multi-award winning interiors blogger, vlogger and presenter. Her blog, Love Chic Living is ranked as a top UK home and interiors blog and provides aspirational but achievable style for a family home. Freelance blogging has given Jen many exciting and fun opportunities including several European design tours, and last year, a move into Pinterest coaching and consultancy for brands and bloggers.